SPRING is finally here! And you know what that means – time for some serious spring-cleaning! I’ve written about this from an emotional perspective in a previous blog (How to rid your life of excess baggage!) but now it’s time to get practical about this. Because when you physically clear the clutter in your life you also emotionally release what is weighing you down. Fortunately for me, I’m naturally a hyper-organized person. Being organized is literally in my DNA. So I decided to sit down with a veteran in the organization world, Professional Organizer, Paula Gardner (of Savvy Solutions) to get her insights and tips to help those for who this is not easy and natural. Decide why you want to be more organized. What benefits will you enjoy? Like anything in life if you don’t have a strong, emotional reason for doing something the motivation and discipline just won’t be there in the long term. 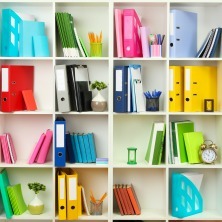 So why is getting organized and eliminating clutter important to you now? Create a vision for each room. Meaning: what will you do in each room? Then as you organize each room you can makes sure that you only have items related to that room in it. For example, if your dining room is only for eating, get rid of papers, mail or anything else that may have accumulated there. This will make the process of clearing space much easier and more efficient.And remember things like to live in ‘families’ just as we do – so keep all stationary supplies together, keep all tools together; keep all warranties and manuals together etc. etc. You may be surprised to find how many pairs of scissors for example you have lying around your home. Avoid buying supplies, at least initially. This is probably not your first attempt to get organized so you most likely have all the supplies, baskets and containers you will need from previous attempts. Be patient and understand that your home or office or life did not get into the state it’s in overnight so do not expect to undo things overnight. Save yourself the paralyzing overwhelm and commit to start small. Decide which room is the biggest priority for you and begin there. You may even just start with one cupboard or shelf or drawer in that room. Chunk it down based on the time you have available. a. Decide that you are only going to keep things that you need for legal or income tax purposes, things that make you feel good and that you love and use. b. Lay out 8 pieces of paper on the floor with the following labels: keep, donate, sell, recycle, throw out, gift, keep but in a different room, I don’t know. c. Now start going through all the items in the room. Touch an item once and put it on a pile. Only allowing yourself to touch something once facilitates you making a decision and making it based on feeling and instinct versus logic and thought. Don’t hold onto items because of what may happen in the future. If you’ve got things that have been lying around unused for a significant amount of time, you most likely won’t use them ever so let them go! d. Put everything in your ‘I don’t know pile’ in a plastic bin or container and put a date on it and store it. Then just take out things as you may need them. Revisit the contents every 3 or 6 months/summer and winter and see what you have not used. At that point it will probably be easier to make a decision to part with the contents. Follow the same strategy as above but have the following piles to separate your clothes into to: Love it/keep it, will never where/part with – consignment store; will never where/part with – women’s shelter, worn out – throw out. It is always easier to part with something when you know it will go to good use somewhere else so see what places in your community you can support. In your closet, have all the hooks on your hangers facing towards you. When you wear something, hang it back with the hook facing the wall. After 6 months see how many hangers are actually facing the wall and then sort out and try part with everything else. Line all your dresses for example on the floor in order from most favourite to least favourite. Then use the rule of 10, 20 or 30% rule and get rid of that number of items from the least favourite end. So if you have ten dresses, give away the 3 least favourite ones. Use the one in one out strategy. I know a lot of my friends use this strategy with their kids and toys. Every time you buy a new item of clothing you let go of something you have. Any other books, part with! There are many organizations looking for books that they donate to homes, schools and other places both locally and abroad. You’ll be making an incredible difference to someone somewhere! Are you are surrounded by paper: invoices, receipts, accountants, magazines, newspapers or flyers at every turn you take? Start the process of getting rid of what you don’t need by sorting them according to what you may need for legal or tax purposes, if it’s a warranty or a receipt to possibly return something, or something useful and relevant that you would not be able to find the information online. Then file them away and shred or recycle the rest. If you don’t have a filing system create one. Going forward commit to either filing or getting rid of mail as it comes in and designate time each week to manage this habit – process, file and/or throw out. You should have the same policy with emails. I encourage my clients to read an email only once – responding, filing or deleting it – immediately. This will prevent you accumulating a back up of hundreds of emails. Also make sure to unsubscribe to anything that no longer serves or interests you. Keep what you love most and make a portfolio. Frame the best of the best. Take photos of their artwork and create a book or album from it. This way you preserve their work and will be much for likely to enjoy it in the future. Their artwork can even make a great coffee table book! For the creatives out there – the artists, knitters, quilters, model builders etc. you probably have a lot of supplies and stuff that you use and may use, right? So create systems to organize your things – keep all you wool in one container, you knitting needles in another, you paint brushes in one or paint in another – you get the idea right. This way the clutter will seem less and you will most likely have more space to work and create! So let go of whatever attachment and emotion you have to all that has accumulated in your life and that is not serving you in any way – the guilt over money spent, not wanting to be wasteful, the fear that you may need something again, the emotion attached to items that are most likely weighing you down without even realizing it. Let go of your fears of letting go and free up space not just in your home but also in your life and psyche as well! You will feel freer and lighter for sure! And then take time to enjoy the new space and energy you’ve created. I hope this inspires you take action. I’d love to hear your ideas and strategies and any before and after photos you have. Previous PostWhy you’re still stuck?Next PostI’m ok with my number! Are you?